with the Shavers of Ancaster. 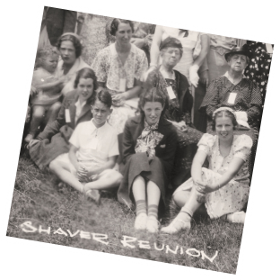 ShaversOfAnacster.com is a collaborative web site for the descendants of John Shaver to share family history and reunite. Through the website we hope to both give and accumulate more information about the descendants and relatives of Wilhelm Schaeffer and his wife Katerinka Werner. Wilhelm and Katerinka and their three children left their Rhineland, Germany home to travel the Rhine and take the schooner ‘Betsy’ out of Rotterdam, the Netherlands,to America. They landed in Philadelphia in 1765. Seeking only to be peaceful farmers when the Revolutionery War broke out, many families left New Jersey to travel north-west to Canada for free land, or to persue a western trek. Visit us here to learn more. You may be pleasantly surprised. 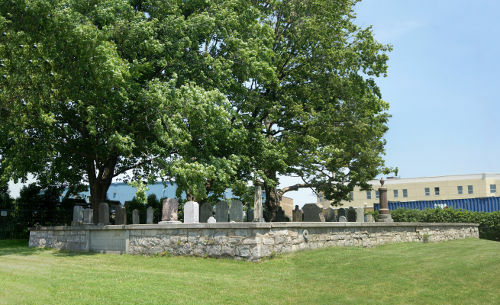 The limestone ashlars of the cemetery walls were completely repointed in the 1980s. Unfortunately cement mortar was used rather than the original lime mortar. Lime mortar, which would have been used in the original construction, is more flexible than cement-based mortar and is more water permeable. When hairline cracks form they are resealed by lime deposits in the water. Therefore water is not trapped behind the wall and the mortar is self-healing. With cement mortar moisture inside the wall becomes trapped. 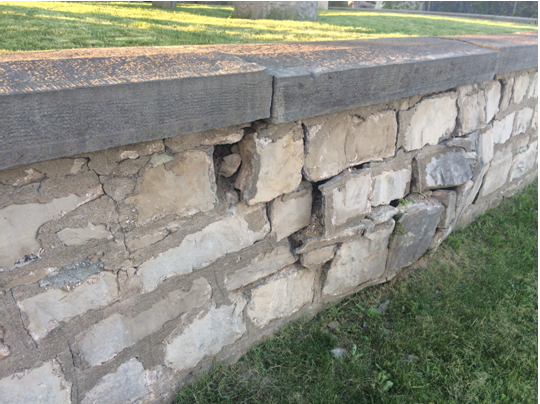 Water pressure behind the wall produces hairline cracks that open almost immediately between the mortar and the stones. Since they do not reseal, deterioration accelerates. This explains why the walls have deteriorated faster in the last couple of decades. 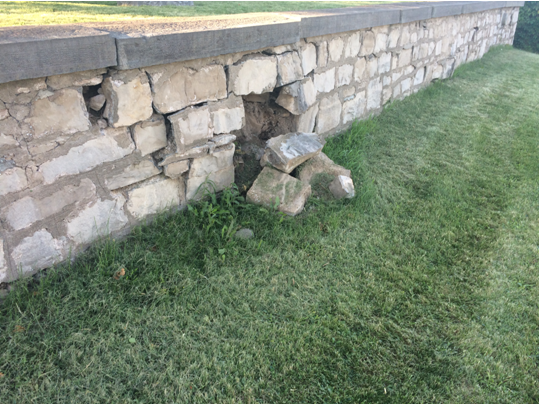 Through emergency fundraising within the family over the summer of 2017, we were able to secure sufficient funds to complete a rebuild of the south wall, including repairs to or new footings if required as well as additional drainage to help avoid similar problems in the future. 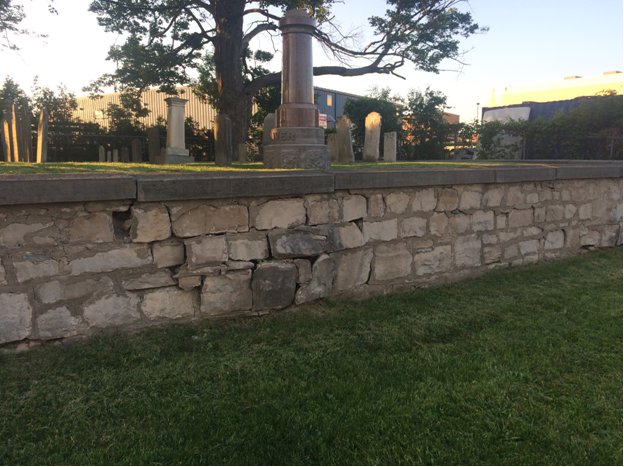 We requested and were granted a heritage permit from the City of Hamilton to complete the rebuilding of the south wall in the fall, targeting completion before the weather became sufficiently cold so as to preclude it. We have now [2017-09-11] completed the planning and thanks to some generous family support, are ready to start the rebuilding of the south wall. 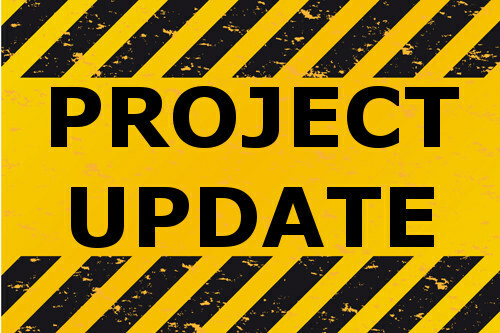 Below is a link to a slide presentation highlighting details of the project. Before work will begin we will honour the memory of our forebears interred within, recognize the importance of the work to be completed and, bless the skills of those who will be labouring here this fall. Plan to stay afterwards to talk with us about the plans and timeline for the project.